It's time for another election. This election features a highly qualified older woman who has experience, passion, and the intelligence to handle the complexities of an executive branch. 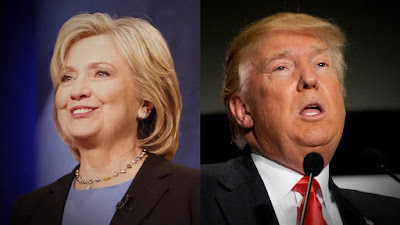 She's going up against a businessman who has never held a public office, is only running so that he can make running his business easier, and offers no real solutions except yelling loudly. No, not these two. This is a campaign for governor of whatever state Springfield is in between incumbent Mary Bailey and nuclear power plant owner, Charles Montgomery Burns. It's amazing how relevant this episode is in this day and age. Homer plans on voting for Mr. Burns because Burns is his boss and he could fire him. Marge, meanwhile, is voting for Mary Bailey. While not much policy is given between these two candidates, it's clear from the ten second scene with Mary Bailey that she is much more qualified than Burns while Burns spends his campaign yelling about taxes being too high and trying to convince people using an actor portraying Charles Darwin that Blinky's three eyes is evidence of natural selection. After Bart catches a fish with three eyes downstream from the Springfield Nuclear Power Plant, Governor Mary Bailey orders an investigation of the plant to determine if the three eyes on "Blinky" were the result of mutation through nuclear waste. Mr. Burns is then cited with 342 violations and either has to pay $56 million to fix them or close down the plant. 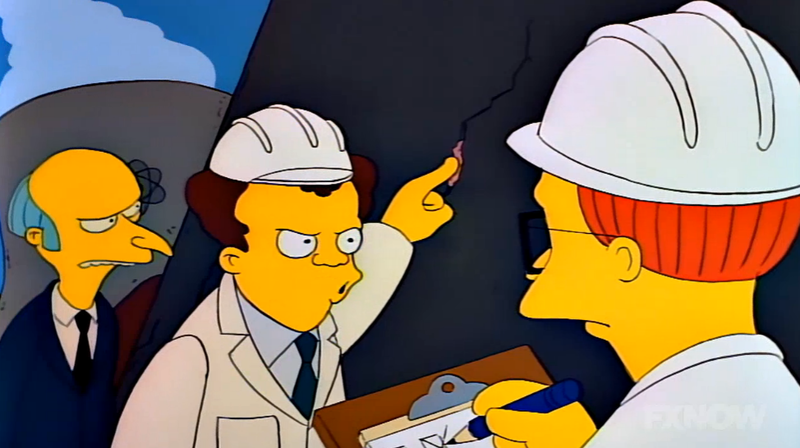 "Gum used to fix hole in cooling tower." Instead of doing the normal thing and working with the government to get the plant up to code, Mr. Burns decides to run for governor then he gets to make the rules because the legislative branch of government doesn't exist. Burns starts off as very unpopular--even despised--while Governor Bailey is popular and expected to coast to victory. Burns' campaign advisors try to make Burns more friendly and down-to-earth and even tell him to smile. They set up an ad where an actor portraying Charles Darwin explains that "Blinky" is not a mutant but the next step in his species' line of evolution. It's a successful gimmick and helps get Burns tied with Governor Bailey. On the night of the election, Burns' staffers convince him to have dinner with one of his middle-class, blue-collar employees. Reluctantly, Homer is chosen. 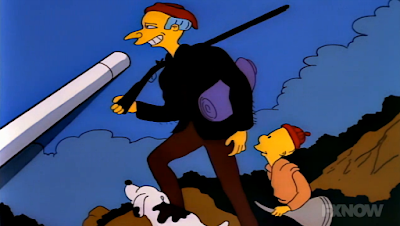 Burns arrives at the Simpsons where he is able to pull ahead of Mary Bailey due to his down-to-earth handling of being knocked over and trampled by Santa's Little Helper and Snowball II. In lieu of actual conversation, the campaign comes up with stock questions for Burns so he can loudly spout off his political talking points. Everything is going great until Marge brings out the main course--baked three-eyed fish. Burns attempts to swallow it but spits it out across the dining room. 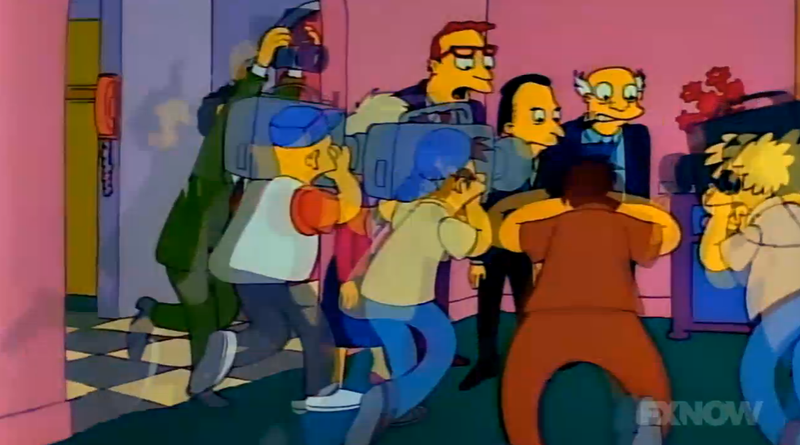 The reporters and photographer rush to get a picture of it and Burns' gubernatorial pursuit is dead. Ruined before it hit ground. Upset, Burns threatens Homer that all of his dreams will go unfulfilled. Homer is worried by this but Marge reassures him that Burns can't take away his dream of a loving family and sleeping in on weekends. When Homer arrives late to work, he gets upset that only plain cake doughnuts are left. He still eats one but sarcastically tells the other guys thanks for saving him a good doughnut. "Oh, look, someone just left all this money out on this table." 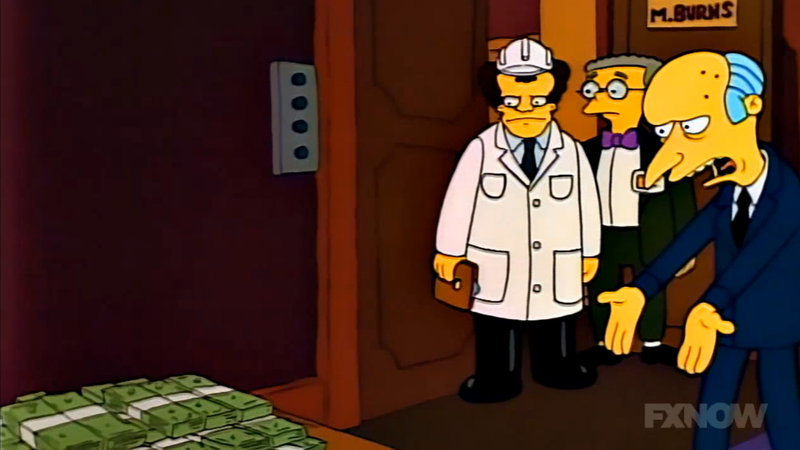 "Look, Smithers. The money and the very stupid man are still here." Burns drunkenly sings "Brother, Can You Spare a Dime", a song that epitomized the Great Depression in 1930 through 1932. To Republicans, the song was an attack on Capitalism but listening to the lyrics isn't a Republican's strong suit. The song is about a beggar talking back to the system and wondering why the hardworking people who actually built this nation suffer while corporations and the rich get richer. Like this episode, this song is very relevant even today. Burns complaining to Homer: "Can't the government just get off our backs?" You're polluting the planet all for the sake of a dollar. It's like those people who constantly do illegal stuff in their homes like sell/produce drugs, and are always bothered by the cops then complain "Why can't the cops just leave me alone?" Maybe it's because you're doing something illegal? Burns, after Homer tells him that he should run for governor: "Do you know how much it costs to run for office? More than any honest man can afford!" True words. Marge: "We're a Mary Bailey family." Homer: "Mary Bailey isn't going to fire me if I don't vote for her." Early polls: 98% of voters rate Burns despicable or worse. Burns: "Why are my teeth showing?" I'd never noticed this foreshadowing before but in Burns' commercial with Charles Darwin, Burns specifically say that Blinky has "a taste that can't be beat". 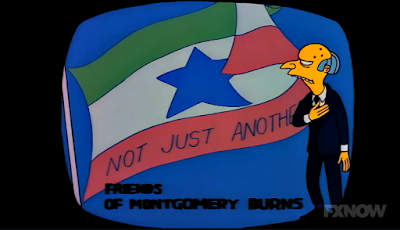 Burns' campaign song: "Only a moron wouldn't cast his vote for Monnnnnty Buuuurns!" Barney is clearly impressed with Blinky's third eye: "Wow! Super fish!" 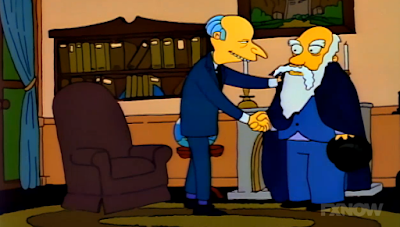 Burns' popularity jumps from 0% to 6% to 7% to 22% after his Charles Darwin commercial airs. Bart: "Is your boss governor yet?" Homer: "Not yet, son. Not yet." Marge serves a three-eyed fish for dinner. What I want to know is, was it unintentional, meaning that Bart just brought home whatever fish he caught, a callback to the first scene, or that three-eyed fish are the only fish you can get in Springfield. Or did Marge purposely cook a three-eyed fish in order to sabotage Burns' campaign knowing he wouldn't be able to eat it? 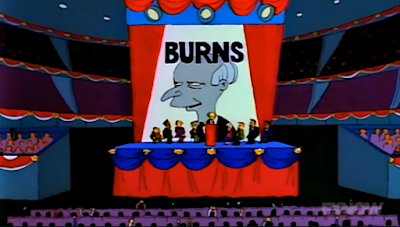 Burns: "This anonymous clan of slack-jawed troglodytes have cost me the election but I were to have them killed, I would be the one to go to jail. That's democracy for you."